As if a rip tide has torn through, this chart drowned the data in the depths of colors, scales and graffiti. 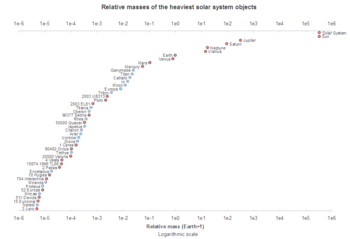 Scales - every chart has its own scale, rendering it impossible to read across charts. Colors - every brand has its own color. This feature is redundant since the data labels already serve the purpose of linking the two columns of charts. Compression - it is impossible to judge the growth or decline of individual companies, especially since only the current market share is provided. If anyone has access to the data, please send them over so we can remake this chart. Or just send in your charts and I'll put them up here. 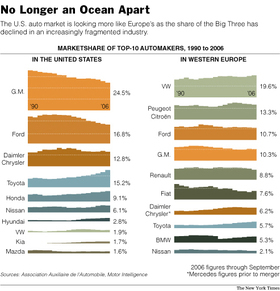 Reference: "Now Playing in Europe: The Future of Detriot", New York Times, Oct 28 2006. The shading to show which team(s) were chasing them is a stroke of genius. Further, the dot plots on the right very cleanly brings out their advantage in pitching. The hitting numbers are mixed. Reference: "World Series Preview", New York Times, Oct 21 2006. 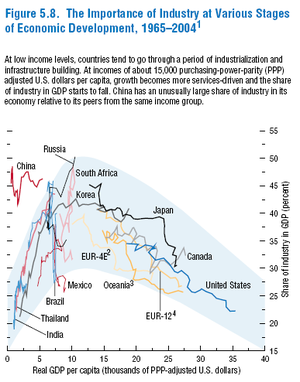 Thanks to Michael S. for sending in this chart from the economists at IMF (via this blog). At its heart, this is a scatter plot that displays the correlation between a country's development stage (indicated by its PPP GDP) and the importance of the industrial sector to its economy. On top of that, the chart adds a third dimension of time by linking the dots together with lines. The lines trace the evolution in each country or set of countries. Some countries (mostly developed nations) have a clear trend; others exhibit choppy curves which imply fluctuating economic conditions. We have created this type of chart when discussing the fabulous Gapminder site. The shading in the chart is supposed to draw attention to an inflection point around $15,000 per capita GDP, wherefrom the industrial sector starts to decline in importance. In my view, that conclusion is forced because Korea is the only curve displayed on the chart that bridged the $15,000 divide. Thus, one can say there exists only one data point supporting this hypothesis. However, one aspect of this chart jumps out at us, which is the chasm between developed and developing countries, right at the $15,000 divide. On the right side, the rich gets richer in a relatively steady fashion. On the left side, the poor remains poor. These nascent economies suffer from a great deal of volatility. What's worse, the slopes are much sharper on the left than on the right, meaning that the gains in GDP are much smaller on the left of the divide. Even more troubling are the cases of Brazil and Mexico which seemed to have endured a decline in the industrial sector without much gain in GDP. Racetrack graphs was a novelty item here some time ago. They made an appearance in the October issue of Wired Magazine, known for its design. We have already discussed information distortion in such charts. This chart fails the self-sufficiency test, forcing readers to read and interpret the data labels, and to ignore the racetrack construct. Graphical elements applied as cosmetics? Charts sacrificing data integrity for entertainment? This takes us back to our previous discussion: can good charts be entertaining? Now flipped over: can entertaining charts be good? 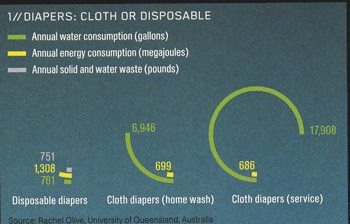 Reference: "Good, Green Livin'", Wired Magazine, 10/2006. At the TCS blog, Tim Worstall attacked a chart comparing global levels of income inequity, originally published by the Economic Policy Institute. His post is here. Tim claimed that this chart proved precisely the opposite of what the EPI intended it to show, that is, that the chart showed that "the poor in America have exactly the same standard of living as the poor in Finland (and Sweden)", two countries which he derided as "redistributionist paradises". From this, Tim concluded that the U.S. is doing enough for the poor. Stephen C., who sent in this chart, was very confused by the length of the bars: left of the divider, the larger the income index, the shorter the bar; right of the divider, the larger the income index, the longer the bar. For the EPI, this is a case of arming the competition. Echoing Robert's comment from yesterday, this is one chart that opines but should have murmurred. The chart is a very convoluted way to study the idea of income inequality. The first bar states that the 90th percentile income in Finland is 1.11 times the median U.S. income, after adjusting for PPP. Notice the simultaneous change in percentile and country, which complicates our understanding of the difference. 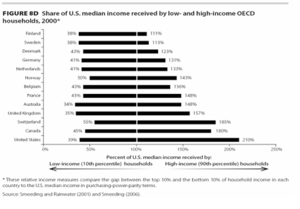 The median income is perhaps the simplest (not most informative) measure of income equality. 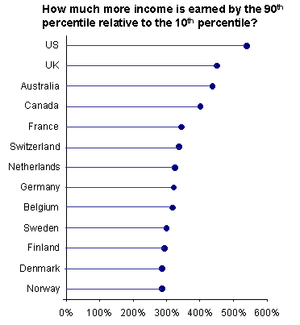 In the EPI chart, the edges of each bar describe the 10th and 90th percentile income in a country. We only know 80% of the population lie within each bar but nothing about how they are distributed. In the revised chart, I plotted another popular measure of income equality, the ratio of 90th percentile to 10th percentile (since the data is readily available from the EPI chart). It's clear that inequality is highest in the English-speaking Western world where the top earners get 4-6 times more than the bottom earners. This income ratio is computed for each country, and can be used to compare across countries without resorting to another index. Reference: "America: More Like Sweden Than You Think", TCS Daily, Aug 26 2006. How high can it go? This chart, sent in by Michael McCracken and attributed to Yale economist Shiller of "Irrational Exuberance" fame, very effectively poses this question. The "hockey stick" on the right side of the chart really hits us like a gigantic question mark. When we have good data, or are looking at the data from the right angle, the charting task is that much easier. Michael especially likes background shading to highlight specific periods. I'm a bit perplexed by the "World War I" label as that period does not appear remarkable to my eyes; it is also the only shaded reason that is not a boom period. The text explains the need to remove "new construction" in order to study housing as an "investment over time". As an outsider to the real estate industry, I find this definition arbitrary. 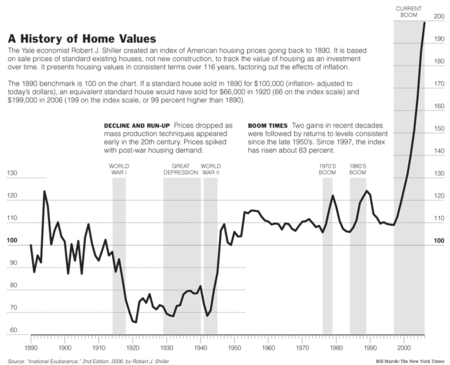 The 2001 data presumably would include the sales price of any house that was constructed from 2000 and back. Why exclude only current-year construction? Could a sale of a one-year-old property be considered "investment" and not "speculation"? Reference: New York Times, Aug 26 2006. I've been slow checking my email lately: several of you have pointed me to interesting charts; I will work through them over the next week or so. This post is inspired by John S. who forwarded two charts, illustrating where the U.S. gets its energy and how the U.S. uses its energy. Next, the Skeptical Optimist blog recast the data onto a construct known to "Marimekko" to management consultants. 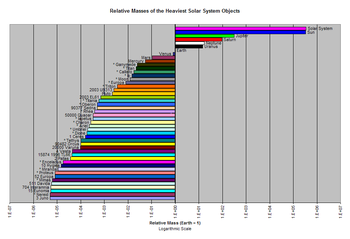 Deconstructed, these are column charts, such that the width of each column represents the relative size of each energy source. 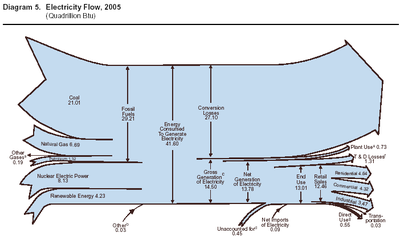 This one does a fairly effective job showing most of our transportation needs are met with oil, our electricity needs are met with coal, our energy sources are roughly split between oil, gas and coal, and so on. One weakness of Marimekko is "inequity": by its origin as a column chart, it elevates one variable over the other. 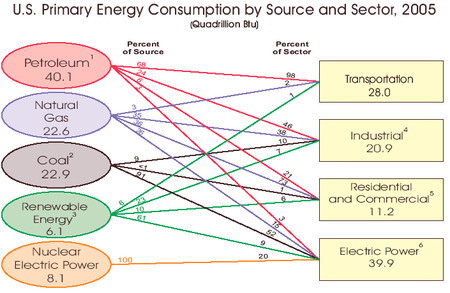 What's the relative size of energy used by the industrial sector (blue)? That's not a question easily answered by this chart. 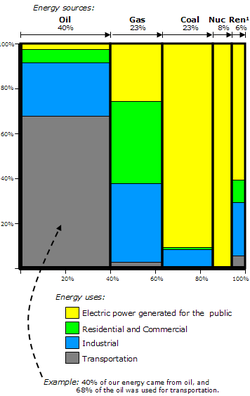 Even when the column segments are adjoining, as in the case of electricity use (yellow), it is very taxing to size up the yellow area relative to the total area. So it is that we seek a graph that treats the two variables (source, use sector) equitably. More later. Update: Jon posted a response here, and points to a tutorial for creating Marimekko type charts.